Twenty two sites for house-building have been identified in Blackpool as part of a new blueprint for future development. Residents are being urged to have their say on the town’s Local Plan which sets out proposals for the next eight years including the need to build hundreds of additional homes and changes to the green belt. Rules have also been updated on policies such as those which govern so called ‘garden grabbing’ and for the protection of open space. Town centre designations are also set to be updated to make it easier for bars to open in streets once earmarked only for shops. The Local Plan allocates land use until 2027 and is a vital tool for town hall planners when considering applications for development. The current proposals are subject to change in the wake of public comments, with further publication of the blueprint expected in the summer. 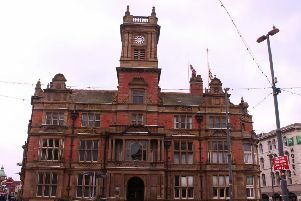 The proposals are available to view in all Blackpool’s libraries and at the Customer Care Centre on Corporation Street. People can also go to the council’s website to see the plans. They have until February 19 to submit their comments. Here are some of the main elements of the eight-year vision. A total of 22 potential sites for housing development have been identified ranging from small parcels of land to council-owned offices. Sites include the former Bispham High School and land off Regency Gardens which has the potential for 274 new houses. Around 200 homes are planned for Grange Park, while the Rigby Road tram depot is potentially earmarked for 100 houses if ambitions to relocate to a new base are realised although this would be in the long-term. Around 150 town centre apartments are also set out in the plan. Blackpool has a requirement for 4,200 new homes between 2012 and 2027, but many have already been built or have received planning permission, leaving provision for 820 homes still required. Sites are also set out for travellers and travelling showpeople on land off Faraday Way in Bispham. The primary area where shops will be concentrated continues to be defined as Houndshill, Victoria Street and some parts of Bank Hey Street, with the priority remaining as retail and cafe/restaurant use. However the new plan is set to remove designated zones which will allow pubs and bars to open in more parts of the town centre. However ‘vertical drinking’ bars will continue to be discouraged using licensing rules, with town hall chiefs likely to look more favourably on seated venues such as wine and cocktail lounges. Amendments are being made to some of the neighbourhood centres in order to help reduce the number of empty premises in areas where there are high levels of long term vacancies. It is proposed to remove Bond Street in South Shore from the local area shopping designation to give greater flexiliby to the type of uses which premises can be given. A new allotment is proposed in the north of Blackpool, providing up to 40 plots on land off Fleetwood Road. Green belt boundaries are proposed to be amended at Faraday Way in Bispham to follow the natural field boundaries resulting in a net gain. But some land would be removed from the green belt on Blackpool’s southern boundary with Fylde, just off Common Edge Road to support growth at the Blackpool Airport Enterprise Zone. The status of Marton Moss as an area of countryside will be removed because the area is now covered by a new neighbourhood strategy with the formation of the Marton Moss Forum. It will leave just a stretch of land between Newton Hall and Mythop Road designated as countryside, maintaining a buffer between Blackpool and Staining. The trend towards developing residential gardens for housing is addressed, with planners highlighting the role of gardens in providing wildlife habitats and preventing flooding. Measures are proposed to resist over-intensive building in gardens with schemes having to meet a number of requirements including protecting privacy, sunlight and outlook.